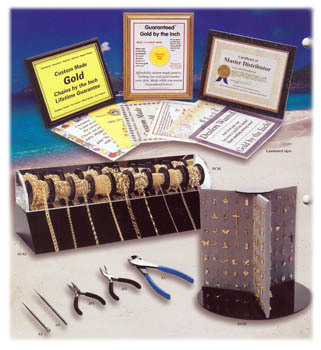 Founded in 1985, goldbytheinch.com, LLC (formerly Images) is a leading manufacturer and wholesale only distributor of gold and rhodium on spools. With over 28 years of experience, we continue to refine our quality, selection and customer support. We specialize in high quality costume jewelry with the authentic 14 karat gold color that is the American standard. W e manufacture over 260 styles of gold and rhodium layered chains from which you can easily custom make chain jewelry of any kind. We complement our chain selection with over 1200 charm styles, as well as a large collection of assembled cubic zirconia bracelets and pendants. We take great pride in reliable on time delivery and very few "out of stock" experiences. Over the years we have built a solid reputation with our clients and are very grateful for our loyal customer base.